Do you enjoy pork on New Year’s Day? Pork Roast? Tenderloins? Sausage and Peppers? Pork and Sauerkraut is our family’s go-to meal to celebrate New Year’s Day, but it’s always taken some advanced planning to make in the oven (4 hours), or in the slow cooker (low 6 hours; high 12 hours). But using an Instant Pot, the cook time is drastically reduced down to only 1 hour, and it tastes amazing! Start by browning the boneless country-style pork ribs. You can do this right in your Instant Pot if it has a “saute” function, or you can do it in a skillet. My IP has a saute function, but I prefer to use a skillet for this part because I’m short, and it’s faster. If browning the pork in a skillet, transfer it to the Instant Pot when both sides are brown. Spread the sauerkraut over the browned pork. By the way, if you use an 8-quart IP, you’ll have enough room to steam some red bliss potatoes (I place them in a small stainless steel mesh basket on top of the sauerkraut). Skillet users - don’t let all those tasty brown bits go to waste…. Turn off the heat and pour the French onion soup into the skillet. The residual heat from the pan will allow the soup to deglaze the pan (dissolve all those yummy brown bits). Add the brown sugar too; stir everything together. Scrape the bottom of the pan to make sure all of those tasty brown bits have dissolved into the soup. Pour the soup mixture over the sauerkraut and give everything a mix. On a side note, I love my cast iron skillets! Back to the recipe, put the lid on the Instant Pot and make sure the vent is set on “sealing”. Depending on which IP model you have, push either the “Manual” or “High Pressure” button. Cook for 30 minutes on “Manual” or “High Pressure”, then allow the pressure to release naturally for 15 minutes before serving. Enjoy! Using the saute function in your 6-quart or larger Instant Pot, heat oil, season pork with salt and pepper, and brown on all sides (see notes below if your IP doesn’t have a saute function). Add sauerkraut; stir together brown sugar and French onion soup (undiluted) and add to Instant Pot. Seal Instant Pot and cook on high pressure for 25 minutes; allow pressure to release naturally for 10 minutes before serving. If your IP doesn’t have a saute function, brown the pork in a large skillet on the stovetop. Place browned pork in IP and pour soup into skillet to deglaze all the tasty brown bits before adding to IP. Alternatively, a single recipe will fit in a 9x13 casserole dish and can be baked in the oven (cover with foil and bake at 350F for 4 hours). OR cook in slow cooker (6 hours on low, 12 hours on high). If you don't have French onion soup on hand, you can substitute an equal amount of water and 1/4 teaspoon of onion powder or minced dried onion. I’m somewhat amazed at the popularity of Instant Pots lately, but they’re such a fast and easy way to cook so many wonderful things, it’s no wonder. If you’ve been wondering which instant pot should you should choose, here’s a anting give them try, but don’t know which model to choose, here’s a primer to get you started. Instant Pot LUX: this 2nd generation model is the most basic. It will pressure cook (on high only), slow cook, steam, cook rice, saute, and keep warm. It also has a manual button that you can set it for whatever time you like. (the original model was the CGX and is no longer in production). Main Features: high pressure, saute, slow cook, steam, makes rice, keeps warm, stainless steel inner pot. Available in 3, 6, and 8-quart. Instant Pot DUO: this one has all the same features is the LUX above, plus an additional yogurt feature (and the pressure can be set on low or high). Main Features: makes yogurt, high pressure, low pressure, saute, slow cook, steams, make rice, keeps warm, makes yogurt, stainless steel inner pot, lid rests in handle, Available in 3, 6, and 8-quart. 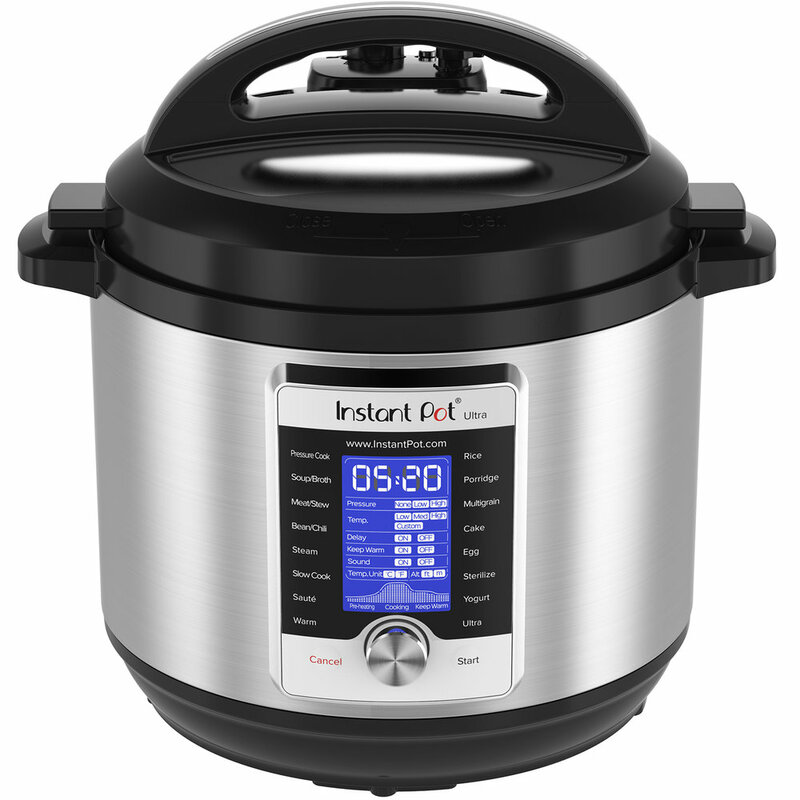 Instant Pot DUO PLUS: this one is the same as the DUO above, but it also has a sterilize function, and egg and cake programs. This one also has a bigger, brighter LED display. Main Features: makes yogurt, low pressure, high pressure, saute, slow cooks, steams, makes rice, keeps warm, stainless steel inner pot, lid rest in handle, sterilizes. Available in 3, 6, and 8-quart. Instant Pot NOVA PLUS: this model is a DUO and DUO PLUS hybrid, including the bigger, brighter LED display, but without the sterilize, egg, and cake functions. This model was originally designed to be sold at Costco. Main Features: makes yogurt, low pressure, high pressure, saute, slow cooks, steams, makes rice, keeps warm, stainless steel inner pot, lid rest in handle. Available only in 6-quart. 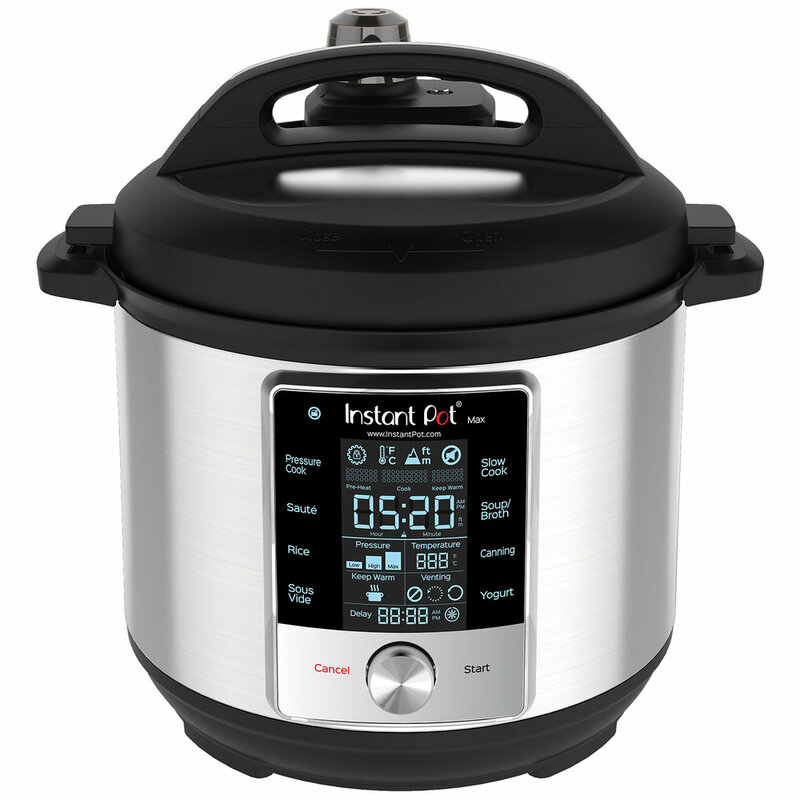 Instant Pot ULTRA: this one is similar to the DUO PLUS above, but the functions are all customizable. You can cook on high or low pressure; steam with or without pressure; set the temperature from 104-208F; set the time from 1 minute to 6 hours; set a delay timer; turn off the keep warm feature... it also has the ability to memorize custom settings. Main Features: self-closing pressure valve, cooks at any temperature, makes yogurt, low pressure, high pressure, saute, slow cooks, steams, makes rice, keeps warm, stainless steel inner pot, lid rest in handle, sterilizes. Available in 3, 6, and 8-quart. Instant Pot SMART WIFI: this one is similar to the DUO above, but it has 3 keep warm temperatures. The wifi feature enables you to keep track of the progress of your IP using your iPhone or android. You can also program the app with custom cook times, but the wifi feature is limited to a range of 30-45 feet from the IP. This model only comes in the 6-quart size. Main Features: cooks at any temperature, makes yogurt, low pressure, high pressure, saute, slow cooks, steams, makes rice, keeps warm, stainless steel inner pot, lid rest in handle, cooks at different temperatures sequentially via script, write, share, or download recipe scripts. Available only in 6-quart. 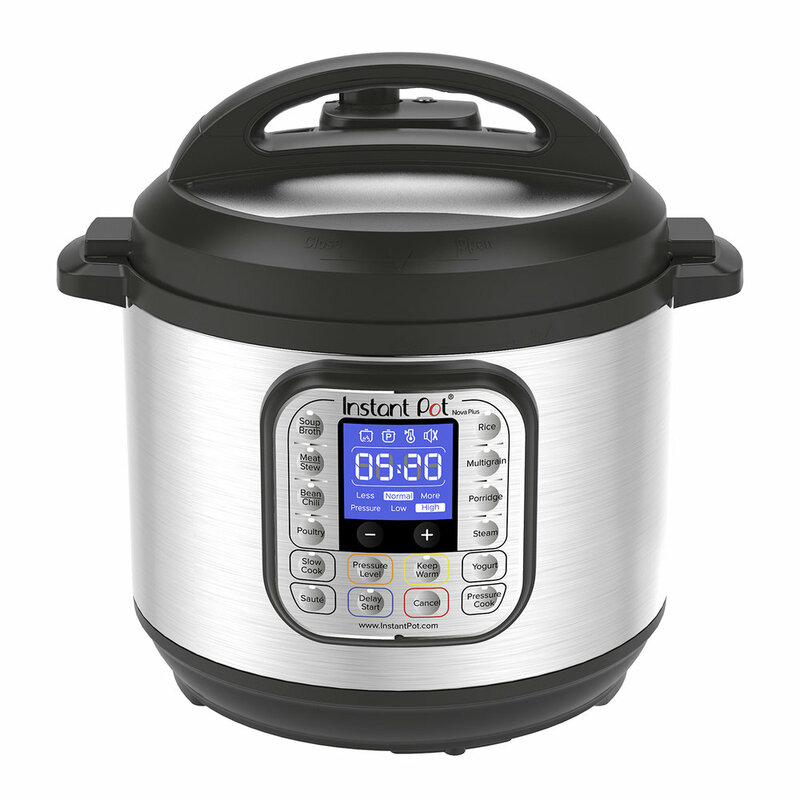 Instant Pot MAX: this one is the newest model and the manufacturer claims it is faster and reaches a higher pressure than the other models (10-15% faster). The higher pressure of this model simulates stovetop pressure cooking more accurately than the other IPs. This model is the only one that reportedly reaches high enough pressure to pressure can. Main Features: reaches maximum pressure (15psi), automatically releases pressure, self-closing pressure valve, cooks at any temperature, makes yogurt, low pressure, high pressure, saute, slow cooks, steams, makes rice, keeps warm, stainless steel inner pot, lis rest in handle. Available only in 6-quart. Instant Pot GEM: although this is officially an "instant pot", it does NOT pressure cook. This is a slow cooker/multi cooker. You can saute, slow cook (high or low), cook rice, bake, steam, roast, and stew in it. It doesn't pressure cook or make yogurt, and the lining has a nonstick coating instead of being a stoneware crock like traditional slow cookers. Main Features: saute, slow cooks, steams, makes rice, keeps warm. Available only in 6-quart. To Recap - If you want just the basics, get the LUX. If you want the basics with the additional yogurt function, I suggest the DUO. If you want the basics with yogurt, egg, and cake functions, pick the DUO PLUS. If you're a techie, chose the SMART WIFI. If you want complete control over all the temps, times, sounds, etc - go for the ULTRA. If you want the most time efficient, with the ability to pressure can, get the MAX. When I was a kid and someone in the family got sick, homemade chicken soup was the go-to remedy. I don’t know why it worked so well, but it did and I’ve continued that tradition by feeding it to my own family at the first sign of any illness. So, last week, when my son unexpectedly came home with a sore throat and deep cough, I immediately started making a batch of my homemade chicken noodle soup. When I realized I was out of noodles, I added wild rice instead. It was a nice variation and I’m happy to report his cold immediately started to go away, and even better, it didn’t spread to anyone else in the house. I’m convinced the magic to this soup is the homemade chicken stock. Here’s to healing what ales you. For this recipe you’ll need about 3 cups of cooked wild rice. On a side note, check it out - this company uses a kind of velcro instead of a pesky zipper-top so their bags can be resealed easily. I wish every company would do the same. Big shout out to LUNDBERG FAMILY FARMS! Ok, back to the recipe. Cook your wild rice according to the package directions, OR cook it even faster in an electric pressure cooker (instant pot). Here’s how. Place 1 cup of wild rice in the pressure cooker. Add 1 quart (4 cups) of chicken stock (I used my own homemade chicken stock, but you could use store bought stock, or even plain water). My stock was unsalted so I added 1 teaspoon of kosher salt. Be careful not to add too much salt if you use store bought chicken stock. Set the cooker to high pressure for 15 minutes, then allow the pressure to release naturally for about 10 minutes. To assemble the soup - place the wild rice in a 5 or 6-quart stockpot. Add the chopped or shredded chicken. Add the frozen mixed vegetables. And add more homemade chicken stock. Heat through and adjust salt and pepper if needed. place all ingredients in a 6-quart stockpot and heat thoroughly. Taste carefully and adjust salt and pepper if needed. Note: To cook wild rice in a pressure cooker (instant pot), place 1 cup dry wild rice in pressure cooker with 4 cups water or chicken stock, and 1 teaspoon kosher salt (omit if using store-bought stock). Cook on high pressure for 15 minutes and allow pressure to release naturally for 10 minutes. Alternatively, cook according to package instructions.